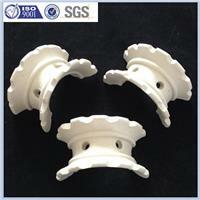 Ceramic Super intalox Saddle is a kind of random packing further developed on the basis of Saddle Ring. 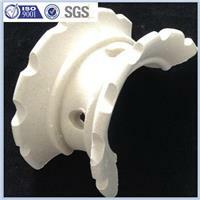 Ceramic Super intalox is a kind of random packing further developed on the basis of Saddle Ring, which both smooth edges are changed to hackly or ripple edges. Comparing with normal saddle, such structure of super saddle can ensure that interspace will be increased a lot when saddles are stacked in the column randomly. Therefore, the resistance to vapor-liquid is decreased and it facilitates flow and distribution of vapor-liquid through the packing bed. As a result, pressure drop is low and mass transfer efficiency is high. 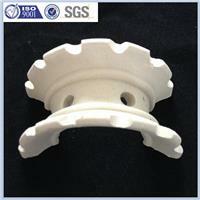 With the characters of high mechanical strength, high chemical stability, and excellent heat endurance, Super Saddle can resist high or low temperature, acid (except HF), alkali, salt and various organic solvents. It's widely applied in various packing towers of desiccation, absorption, cooling, washing, and regeneration in industries of petrochemical, chemical, metallurgy, gas and oxygen generation.